From the moment that this movie started I knew that I was in for one hell of a ride. Few movies make me feel that way right off the bat but when they do they usually end up being something truly special. While using a mobster backdrop as the scenery for social commentary is hardly a new concept, the cynical, grim & controversial nature that it’s presented in in Killing Them Softly is what truly forces you to pay attention. Set in the middle of the recession, the stark mood and blatant force of the film feel warranted and even appropriate instead of coming off as heavy handed. Andrew Dominik does a fantastic job at bringing this seemingly pre-apocalyptic view of America and the dirty characters that inhabit it to life. There’s nothing pretty about this world and Dominik really makes sure that we’re aware of that. He also does a great job at getting the most of the scenes by letting a scene run a bit longer then you’re comfortable with and building very real tension. The ensemble acting in this is fantastic all around with Scott McNairy, Ben Mendelsohn & the ever impressive, James Gandolfini standing out particularly but ultimately it’s Brad Pitt that steals the entire movie. His character exudes cool but it’s a cool that stems from apathy and lethargy. He’s a man who’s been in the game for so long that he knows the system like the back of his hand and he’s tired of all the bullsh*t. He’s walking, talking cynicism in a leather jacket & aviators with a cigarette hanging out of his mouth and you can’t help but be intrigued. The script, also provided by Andrew Dominik, is a brilliant mix of insanely dark but genuinely hilarious comedy, vulgar profanity and very honest confessions/anecdotes. None of the dialogue feels out of place here and it only adds effect to the movie’s controversial tone. The cinematography is very raw & unflitered which gives the movie the feel of old procedural cop dramas like Kojak & Columbo and combined with Dominik’s surefooted direction, Killing Me Softly has an interesting mix of the past and the present. There is no score in this film, instead there are a set of old rock/folk songs that are hilariously placed and totally appropriate. This movie has the best ending of any movie that I’ve seen all year (and possibly one of the best of all time). There is literally no better way that they could’ve closed a movie of this nature and that scene alone could earn Brad Pitt an Oscar nod. There will inevitably be those that won’t agree but I honestly can’t think of anything that I had a problem with here. In my mind this movie hit all the right notes and was executed perfectly. Killing Them Softly is one of those rare movies that comes along and ends up being so different from everything that came out that year that people can’t help but take notice. It’s raw, edgy, cynical, dark, eye opening and downright hilarious all at the same time. People actually clapped at the end of this. It’s a movie that’s fully aware of the urgency and importance of it’s message and doesn’t hold back once. This movie is the personification of the quotation marks on the term “The American Dream”. I’d be hard pressed to find a movie that was more timely and culturally relevant to come out this year. 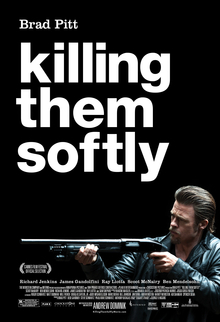 Stacked with a fantastic ensemble cast, hard hitting social commentary, ballsy direction by Andrew Dominick and quite possibly Brad Pitt’s best turn in years; Killing Me Softly is a film that might not be appreciated by everyone, but one that people will be talking about.